Foster the Fourth—and ICE CREAM on the First! 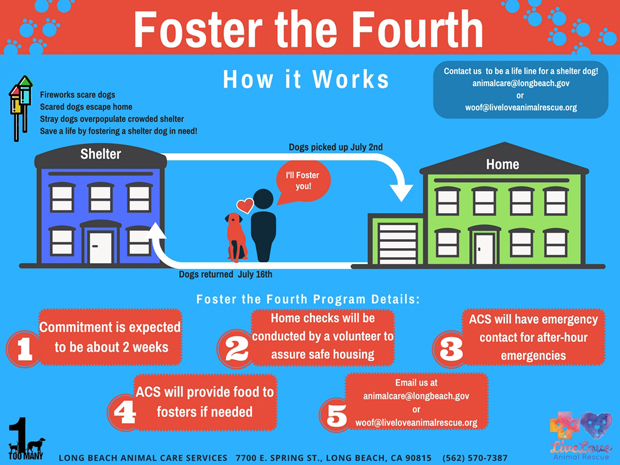 A previous Scratching Post article (“Foster the Fourth—Team Effort for a Safe Holiday for Pets”) about an ingenious idea developed from a similar one in the L.A. County Shelter: Shelters fill up with lost, frightened dogs during the period before and after the Fourth of July, and they squeeze the shelter residents out of their spaces. So—people like you and me can temporarily foster a dog while the owners of the others are located. 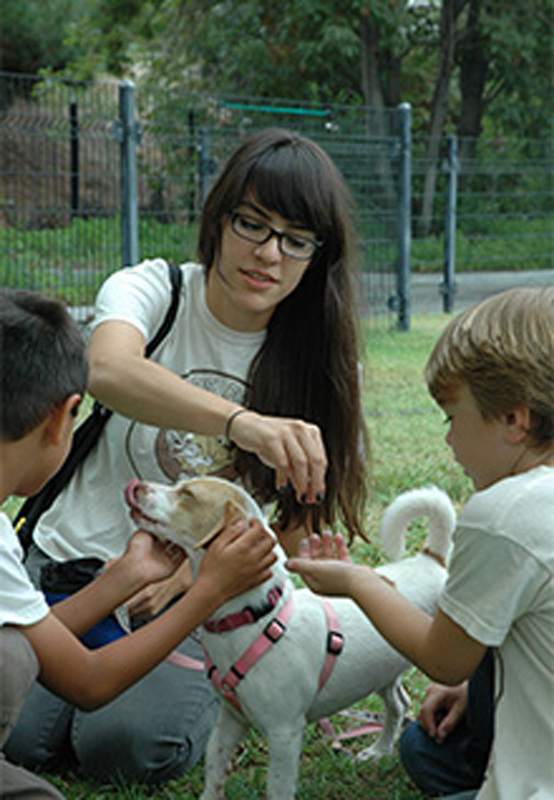 LiveLove Animal Rescue’s founder, Emily Ghosh, approached Long Beach Animal Care Services (ACS) with the idea of ACS developing its own version, and the shelter’s Manager, Ted Stevens, got to work. In the next couple of weeks, Pet Projects will feature a few of the candidates. I had three of them, but I was told right after they sent out the photos that one of them had a foster already and one got adopted! So, hurry up and email [email protected] before they run out! The program will provide everything necessary for the dog’s upkeep, including adoption applications in case you decide that that dog isn’t going anywhere! Horton (ID#A587143) came into our shelter with a laceration on his foot, abrasions on his feet, worn paw pads, an abrasion on his scrotum and a broken tibia. He may be the dog with the most visits to our vet, as he was in need of constant care to help his broken leg heal. Our medical team observed him as shy at first but always compliant during his medical treatments. Horton is a sweet and quiet boy with low energy but he’ll need someone to help him with his leash manners, especially if he hears a Who. During his cat test, he showed no interest in a kitty that swatted and hissed at him. He’s about two years old. Find your new BFF and everything that he or she could ever want or need, in one place. Long Beach Animal Care Services (ACS) and other rescues will be bringing some wonderful dogs ready to go home with their new people. Everything is high quality at Pet Food Express, and that includes the adoptive pets! Check out the Cat Adoption Center, featuring fine felines from Long Beach Animal Care Services and Stray Cat Alliance. 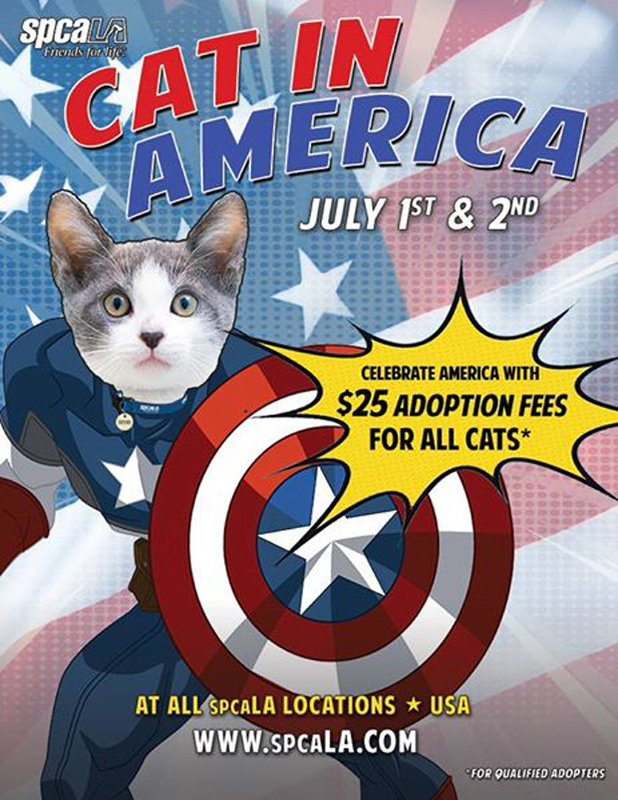 Fourth of July Cat Adoption Special! 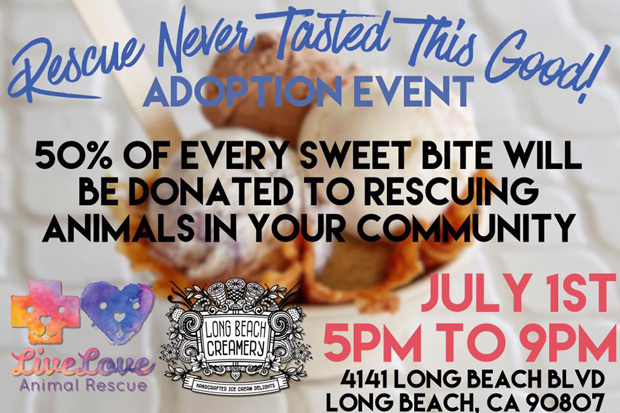 Live Love Rescue Ice Cream Social! Ice cream, oh, ice cream! And some of the most outstanding handmade cold stuff in town to support one of the most outstanding rescuers anywhere—LiveLove Animal Rescue! 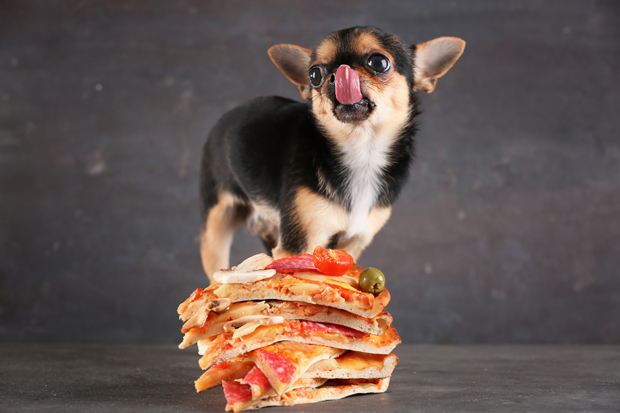 With 50 percent of the tab going to the animals, those little guys get a treat, too! Stop for the cats, and stay for the coffee. Or is it vice versa? No matter—the coffee’s great, the pastries are great, and the cats are really great. And just like the coffee and the pastry, qualified adopters can take a kitty home! This is a heck of a lot of fun! 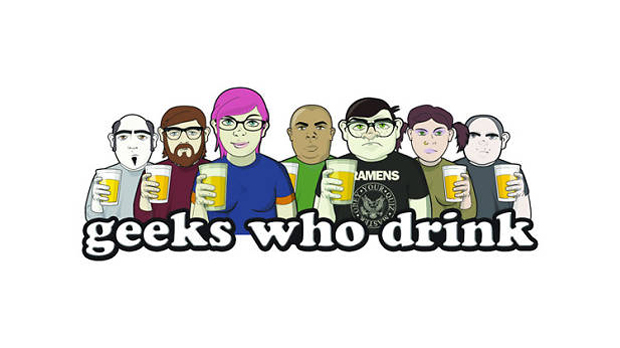 Unlike the classic trivia game, this is a multimedia contest between teams whose questions go far beyond “How many dogs played Lassie?” They call it trivia for nerds, but on this night, it’ll also be for cats and dogs at spcaLA. There’ll be a cash prize for the winning team, and the rest of the purse will go to the pets! Instead of giving up a meal to help someone, have one and help! Build your pizza at PizzaRev, and 20 percent (wow!) of the bill will be donated to help the homeless shelter pets of spcaLA. The grassroots free spay/neuter organization Fix Long Beach invites you to make an appointment for your unfixed dog, or get vouchers for free procedures for your dog or cat! These clinics are generously sponsored through Hope for Paws and Eldad Hagar. Visit this link for qualifications and an application for your appointment. There is also a donation button to help Fix Long Beach continue their efforts. Click the organization’s Amazon Wish List link to donate items, or bring them to the event if you find a better deal! Let’s continue to help make Long Beach no kill, one pet at a time! 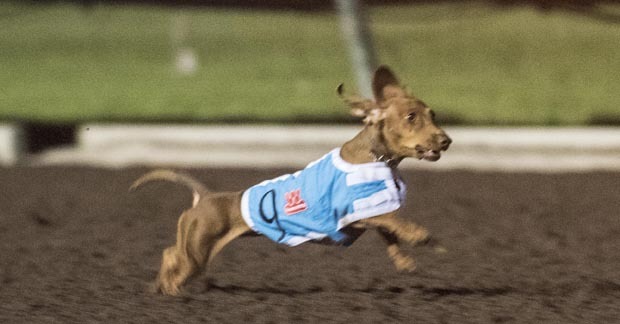 Herding cats is nothing when it comes to getting dachshunds to race along a course—but that’s the fun of it all! This oft-hilarious event features one qualifying race, 10 trials, one specialty “big” versus little match and, of course, the grand championship at the end. Each trial winner will receive $100, and the champ will get a bunch of prizes, including a $1,000 award—that’s a lot of grain-free kibble! Come early, because this event is very popular, and general admission fills up quickly! No ice chests, and no dogs allowed at event except for the racing guys. Best of all, all proceeds go to Seal Beach Animal Care Center. Visit the Wiener Nationals website for more info! Free event—spcaLA provides all the supplies. Foster parents provide the home and the TLC. Want to help pets? Become a foster parent by submitting an application and attending a foster class. Application available here. Please call 323-730-5300 x300 for more info. We can’t do it without you! Stanford’s group is looking to purchase about 10,000 square feet of warehouse space with a potty area and are partnering with a design group. Click on the link in the header to find out all the details of this enterprise. spcaLA Friends for Life Summer Camp™ Registration! spcaLA Friends for Life Summer Camp is for kids 8 to 13. At camp, kids learn the basics of pet care and responsibility, respect for all animals, and the beginnings of dog training, all while making new friends! There are eight Monday through Friday sessions, running June thru August. Vouchers that take a big bite, so to speak, out of the cost of spay/neuter procedures are available at ACS during their public hours. Visit this link for information on clinics that accept the vouchers and for other spay/neuter assistance. For low-cost vaccines, visit this link. 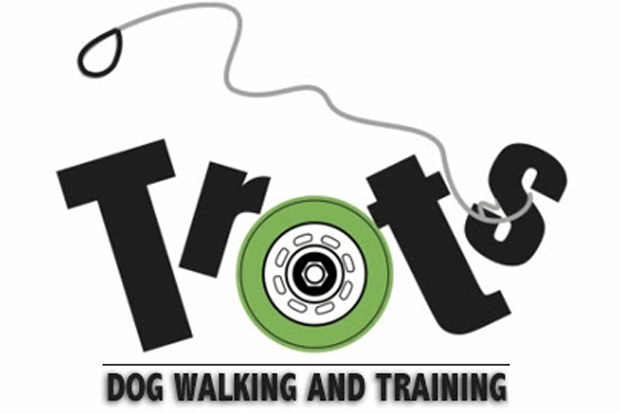 Note that pet owners must be 18 years or older, all pets must be on leashes or in carriers, and only healthy and non-pregnant animals will be vaccinated. Please bring prior vaccination information with you to the clinic. Vaccination and microchip services are provided for pets residing in any city. Licensing is provided for residents within our jurisdiction at Saturday clinics; please bring your renewal notice and rabies certificate with you.